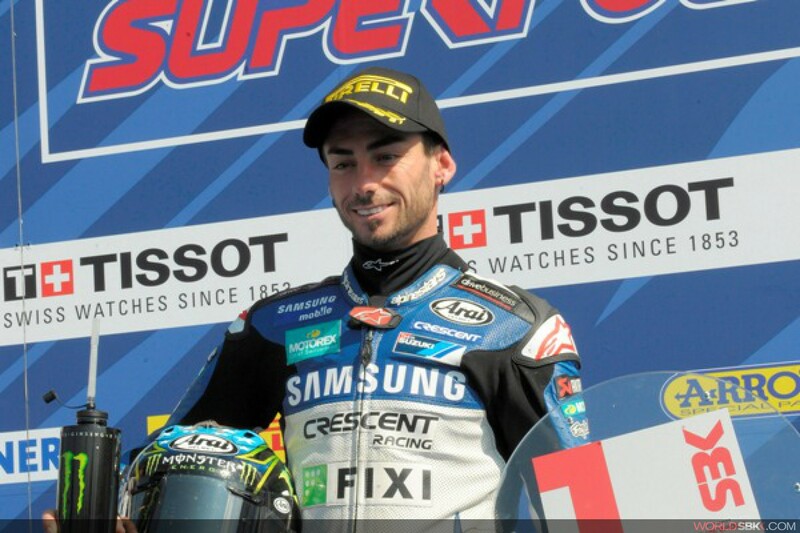 John Hopkins (Samsung Crescent Racing Suzuki) rocked the WSBK regulars with the Tissot-Superpole win at Silverstone. The American rider, a regular in BSB this season, took a new track best of 2'04.041 in the last of three superpole contests. He held off the challenge of Irish rider Eugene Laverty (Yamaha World Superbike), Leon Camier (Aprilia Alitalia) and championship leader Carlos Checa (Althea Racing Ducati). Sylvain Guintoli (Effenbert Liberty Ducati) was fifth and Laverty's team-mate Marco Melandri sixth. Max Biaggi had his worst qualifying of the year, taking his Aprilia Alitalia machine to 11th on the grid, having crashed in Superpole 1.